The 9,000 square feet Ranch Saloon is a premier Country Western live music and dancing venue seating up to 400. The venue features a state-of-the-art sound system and acoustics, a lowered maple dance floor allowing seated patrons to watch the act unobstructed by dancers, as well as two bars and VIP booth seating. The adjacent Ranch Restaurant is acoustically isolated, enabling diners to enjoy quiet dinner conversation while bands play next door. This 10,000 square feet restaurant captures the rustic style of California wine country, providing seating for 263 patrons, with an additional 100 seats in the covered porch and trellised patio. Adjacent is the Ranch Saloon live entertainment venue, seating an additional 400. Complete transformation of an existing open-air seating area into a state-of-the-art performance venue. A three-story stagehouse includes workout, dressing and staging rooms as well as audio and lighting equipment and controls. The fabric roof structure includes catwalks, stage lighting and sound systems. McPeek's Dodge needed expanded offices, and an enlarged showroom for their existing facility, with the new building needing to conform to Chrysler's design standards. GAA created a design that fulfilled all the client's needs, and satisfied Chrysler's standards. 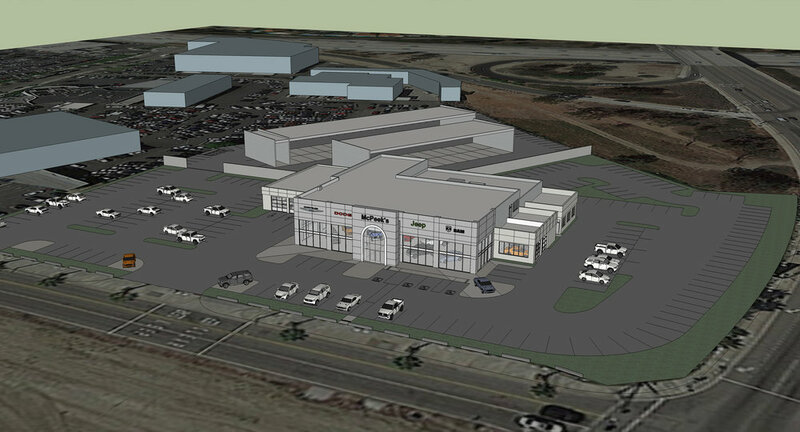 The resulting site included the 10,500 square feet office/parts/showroom, a lot displaying nearly 200 vehicles, and two service buildings with 55 bays. Portions of the existing showroom and service area were preserved and incorporated for value.